New York, NY (Monday, November 26, 2018) – The Independent Filmmaker Project (IFP) tonight announced the winners of the 28th Annual IFP Gotham Awards at a ceremony held at Cipriani Wall Street in New York City. Winning the Best Feature award was The Rider, director Chloé Zhao’s intimately lyrical, contemporary Western portrait of an injured young rodeo bronc rider’s journey toward a potentially compromised future. The award for Best Documentary went to Hale County This Morning, This Evening, director RaMell Ross’ adventurously impressionistic and deeply poetic portrait of the lives of two young African American men in rural Alabama filmed over five years. The IFP Gotham Audience Award, voted by IFP members, went to Won’t You Be My Neighbor?, Morgan Neville’s intimate – and massively popular – documentary on Fred Rogers, exploring both the public and private side of the man who invited generations of children and adults into his television neighborhood. Winning the award for Best Actor was Ethan Hawke for his performance in First Reformed as a tormented parish pastor whose ministering to a troubled couple sends him on a path toward his own redemption. Scoring a second award for First Reformed was veteran writer/director Paul Schrader who won the Best Screenplay award. Toni Collette was voted Best Actress for her demanding and expansive performance in Hereditary as a guilt-ridden mother who battles through increasing levels of grief and fear to horror as the legacy of a poisoned family tree reaches its culmination. In the “breakthrough” categories, Eighth Grade scored two wins. Elsie Fisher won the Breakthrough Actor award for her delicately precise and touching performance as a shy and vulnerable teen enduring the final week of middle school while achieving small victories of confidence as she heads toward high school. Fisher’s director – former teen YouTuber, comedian, and musician Bo Burnham – was voted the Bingham Ray Breakthrough Director award for so accurately and sensitively capturing the world of Eighth Grade, his debut feature film. For breakthroughs in television and digital media, the Breakthrough Series–Long Form award, which aims to honor work that “expands the possibilities of creative, independent storytelling and enriches the landscape or pushes the boundaries of ‘television’” was won by Killing Eve, the comically original BBC America series starring Sandra Oh and Jodie Comer in which a female MI5 officer is assigned to track down a skilled psychopathic assassin, turning into a cat and mouse game of mutual obsession. The Breakthrough Series–Short Form award went to the vibrant and serio-comic 195 Lewis, in which a black lesbian couple in Bed-Stuy, Brooklyn, navigates their relationship surrounded by their distinctively original black queer friends. As previously announced, in addition to the competitive awards, a Special Jury Award for ensemble performance was presented to Olivia Colman, Emma Stone, and Rachel Weisz as the leads of Yorgos Lanthimos’ The Favourite. Career Tributes were also given during the ceremony to actors Rachel Weisz (presented by Michael Sheen) and Willem Dafoe (presented by Laurie Anderson), director Paul Greengrass (presented by Frank Marshall), and producer and Founding Chairman and CEO of RadicalMedia, Jon Kamen (presented by Katherine Oliver). Also during the ceremony, a “Made in NY” Award, given by the Mayor’s Office of Media and Entertainment (MOME) to honor excellence in New York City’s creative community, was presented by Commissioner Julie Menin to Emmy Award-winning television host, bestselling author, filmmaker and activist Sandra Lee. 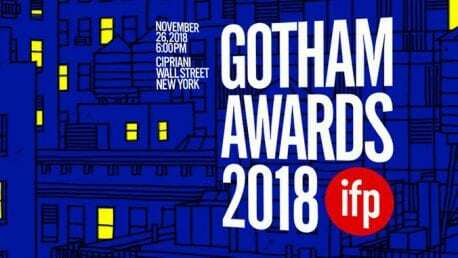 The Gotham Award ceremony was streamed on Facebook Live on FB/IFPFilm. The Best Feature jury included Judy Becker, Geoffrey Fletcher, Jon Hamm, Catherine Keener, and Bill Pohlad. The Best Documentary jury included Rachel Grady, Alan Jacobsen, Asif Kapadia, Ross Kauffman, and Dawn Porter. The Audience Award was voted for on-line by IFP members. The Best Actor jury included Lisa Cortés, Alexa Fogel, Alessandro Nivola, Mike White, and Constance Wu. The Best Screenplay jury included Stephen McKinley Henderson, Phyllis Nagy, Whit Stillman, Michael Taylor, and DeWanda Wise. The Breakthrough Actor jury included Anna Boden, Effie Brown, Chris Messina, Zac Stuart Pontier, and Lois Smith. The Bingham Ray Breakthrough Director jury included Wren Arthur, Natasha Lyonne, Matthew Porterfield, Kathryn Schubert, and Alfre Woodard. The Breakthrough Series – Long Form jury included Radha Blank, M. Blair Breard, Tatiana Maslany, Amy Seimetz, and Samira Wiley. The Premier Sponsor of the 2018 IFP Gotham Awards is The New York Times, and the Platinum Sponsor is GreenSlate. The Official Water Partner is FIJI Water, the Official Chocolate Partner is Lindt Chocolate and the Official Wine Partner is Robert Hall Winery. The Official After-Party Sponsor is Allbirds. The IFP Gotham Awards, selected by distinguished juries and presented in New York City, the home of independent film, are the first honors of the film awards season. This public showcase honors the filmmaking community, expands the audience for independent films, and supports the work that IFP does behind the scenes throughout the year to bring such films to fruition. Congratulations to IFP’s 2019 Rotterdam Lab Fellows!